Six space station astronauts will celebrate New Year's in space. Top (left to right): European astronaut Andre Kuipers and American Don Pettit. Bottom (left to right): Russian cosmonaut Anton Shkaplerov, American Dan Burbank, and cosmonauts Oleg Kononenko and Anatoly Ivanishin. The six astronauts living on the International Space Station may not be able to see fireworks from their orbital home, but the dramatic views of the Earth below will provide a stunning backdrop for them to ring in 2012 from space. From about 240 miles (386 kilometers) above Earth, the crew of the International Space Station recorded a special New Year's message for everyone on the planet. "My crew and I, we're all here to take a few minutes out of our time to wish everybody on planet Earth a happy new year from low-Earth orbit aboard the International Space Station," said NASA astronaut Dan Burbank, commander of the station's Expedition 30 mission. 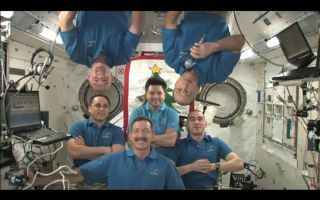 "From aboard the International Space Station — a truly international space station, built by countries around the world — from a truly international crew, we wish you all a happy New Year's," Burbank said. In the video, Burbank and his five crewmates gathered together in front of a festive banner of a Christmas tree. Each spaceflyer shared their thoughts and wishes for everyone in 2012. "This is my first space journey and it's going to be my first New Year's in space, and I must say it's just amazing to see our beautiful planet from space," Russian cosmonaut Anatoly Ivanishin said. "I would like to wish everybody on this beautiful planet new year [for] his or her dreams to come true." Fellow cosmonaut Anton Shkaplerov also wished everyone happiness and health in the New Year. Burbank, Ivanishin and Shkaplerov arrived at the space station on Nov. 16 to begin a months-long mission. They were joined by three new space station residents on Dec. 23, when NASA astronaut Don Pettit, Russian cosmonaut Oleg Kononenko, and European astronaut Andre Kuipers linked up with the orbiting outpost in their Russian Soyuz spacecraft. The six spaceflyers, who make up Expedition 30, have already celebrated Christmas together in space. On Christmas, the astronauts had a chance to speak to their family and friends via Internet phone or video conferencing and could have that chance again on New Year's. After ringing in 2012, the space station residents will also commemorate Russian Orthodox Christmas on Jan. 7. Kuipers, who is from the Netherlands, offered a New Year's message in Dutch before passing the microphone off to Pettit. "I wish everybody a New Year, and this is a good time to reflect upon where we have all been and where we might want to go," Pettit said.